Eldest son of Shilparatnam. Sri. S. Shanmugam Sthapati, Sthapati Santhana Krishnan follows the footsteps of his father and continues to be a Temple Architect. Sri. S. Shanmugam Sthapati is a well experienced Temple architect who has been with Dr. Ganapati Sthapati since the age of six. He was the chief executive sthapati for Dr. Sthapati’s prestigious projects Saint Thiruvalluvar statue, 133’0 ht. granite stone structure that withstood the Tsunamic waves in 2004, Kanyakumari and Sanmarga Iraivan Temple, Kauai, USA. 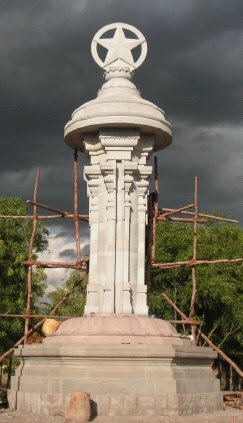 He has constructed number of Temples in India and abroad. Sthapati Santhana Krishnan completed his Bachelor’s degree in Temple Architecture from The college of Architecture and Sculpture, Mamallapuram in the year 1998 after which his interests deepened in exploring the intricate science of Sthapatya Veda. For which he studied M.A., M.Phil in Sanskrit Language from Ramakrishna Mission Vivekananda College, Chennai. 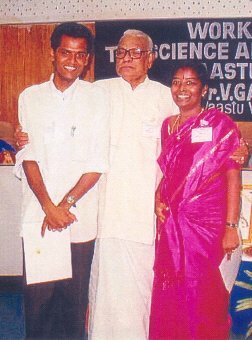 Dr. Sthapati appointed him in his office while he was in college, which helped Santhana Krishnan gain practical experience at an early stage. Being associated with Shilpguru Dr.V.Ganapati Sthapati, Santhana Krishnan’s research activities in the ancient Texts of Ainthiram and Pranava Vedam widened. 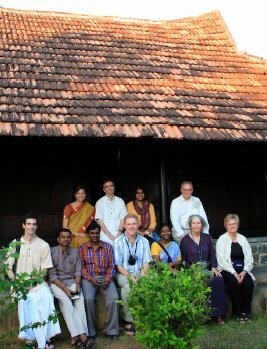 He began to assist Dr. Sthapati in his research works and has presented papers related to Ainthiram. Evidences of information from MAYAN’s Ainthiram and Pranava Vedam were explored and identified in Tholkaapiyar’s Tholkappiyam, Thirumoolar’s Thirumandiram and Ramalinga Adigalaar’s Thiruvarutpa by Sthapati Santhana Krishnan, which gained appreciation among scholars. His search for more knowledge on Mayonic science continues. His research works include the studies of 108 Upanishads wherein he has found references relevant to Vastu shastra. He is presently translating Mayan’s Pranava Veda from Tamil to English. He has assisted Dr. Sthapati in conducting Vastu classes for International Institute of Mayonic Science and Technology, Chennai and American University of Mayonic Science and Technology, USA and is a Faculty for AUM. He is also a good speaker and has delivered speeches in number of conferences along with Dr. Sthapati. A contemporary architect whose interest in the Traditional Indian architecture developed gradually during her periodical visits with Dr.V.Ganapati Sthapati, while receiving the guidance for her final year thesis project – Vedic Village (a topic that focused upon the application of Traditional Sthapatya Vedic principles in designing of buildings that will be suitable for today’s life style). After completion of Bachelor’s Degree of Architecture from Hindustan College of Engineering Madras University in the academic year 1999, Ms. Krithika decided to learn more on Sthapatya Veda and joined as an Architect in Dr. Sthapati’s organization. She has designed a number of Vaastu buildings like residences, schools, hospitals, factories, Religious and Monumental buildings, etc. under the tutelage of Dr. Sthapati for 9 years. By blending traditional vaastu grammar with modern space concepts, Krithika has been successful in creating magnificent structures that are spiritually and physically appeasing. Her first residential project in Chennai, Mr. Santhanam’s residence was designed as a pure Vaastu building. This project brought her into limelight when Dr. Sthapati, the client and herself were interviewed by the Discovery Channel team and telecast on Asian Enigma series. During her career as a Sthapatya Vedic architect in Trinidad & Tobago, she along with her husband has designed remarkable projects thereby exposing Trinidadians to this wonderful Science of Sthapatya Veda. Her vaastu consultation services are spread worldwide. Ms. Krithika assists Dr. Sthapati in his research works and her illustrations appear in most of the books authored by Dr. Sthapati. She has delivered lectures along with Dr. Sthapati for foreign delegates during the annual workshops on Sthapatya Veda conducted by International Institute of Mayonic Science and Technolgy Chennai and American University of Mayonic Science and Technology USA. She is a Board member in the American university of Mayonic Science and Technology USA. 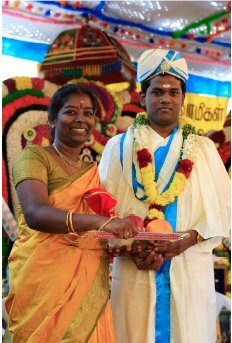 Her interests in Mayonic Science have inspired her to assist her husband Sthapati S. Santhana Krishnan in the translation of Pranava Veda. She has presented papers on the Application of Sthapatya Vedic principles in Anna University Chennai.